I got the Terrorizer cassette sometime when it came out. I used to blast it driving to the mountains to go snowboarding and blast it in the Bear Mtn. parking lot while getting ready. Some people would look over at us with strange looks. The machine gun blasting speed of the drums and the strength of the guitar riffs and the rage of the vocals all make me smile. Thirty years later I still play this tape when I go snowboarding and anytime the desire to play one of the best grindcore albums. Got the FDR record too! Good stuff. I miss the late 80's and early 90's. Stuff nowadays is nowhere close to World Downfall. Sounds great, looks great. Duh, it's an FDR of course it sounds great. One of the greatest (if not the greatest, sorry Napalm Death) Grindcore albums ever! The precision and speed of Sandavol's drumming alone has never been equaled in grindcore even to this day. Pete Sandavol had just been put through a year of intense drumming scrutiny as the new drummer for Morbid Angel which culminated in the brilliant album "Altars Of Madness." So he was physically and mentally at an all time high when he and the rest of Terrorizer prepared to enter Morrissound Studios with Scott Burns to bang out the album as quickly as possible. The end result is a classic Grind/Metal album that stands the test of time and helped launch the careers of Morbid Angel, Scott Burns and resulted in Jesse Pintado being offered the guitar spot in Napalm Death which also quickly resulted in their amazing album "Harmony Corruption" which was also recorded just 1 year later at Morrissound with producer Scott Burns. No need to buy it on here anymore. Earache is reissuing it on vinyl and it looks good. I just bought this on Ebay. Anyone have any info on this version? Anyone looking to buy this record and are tired of these ridiculous prices people are asking on here should go to the earache website. They are reissuing it in "full dynamic range" and are taking pre-orders now for only $16 plus shipping. I have some of their "full dynamic range" reissues and they sound amazing. A testpressing sale pushed the max. price up recently. This is the kind of bugs which damages the excellent reputation of discogs. Agreed, slimelord. Repulsion was first, and it's still an absolute classic, but this remains grindcore's definitive (up until present, anyway) milestone. I have the cd version with a red cover backround, blue terrorizer and green world downfall text. but I cannot find anything about a red version. Does anyone know something about it? I have a question regarding which version of this album that I have. 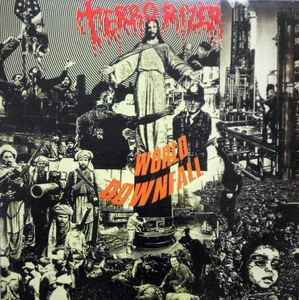 Mine has the Terrorizer logo in red with the album name World Downfall in purple with the artwork being blue...anyone know?